Porsche Motorsport has chosen a new young racing driver to support: For 2018, Julien Andlauer from France will receive backing as a Porsche Junior. The 18-year-old was nominated by Porsche Carrera Cup France to take part in the two-day selection programme, where he came out on top against eight international candidates. At the wheel of a 485 hp Porsche 911 GT3 Cup, Andlauer will contest the 2018 Porsche Mobil 1 Supercup as a Porsche Junior. “We’ve made a detailed analysis of the data and results from the shootout. Of the nine participants, Julien Andlauer impressed us the most. He’s very young and he has a lot of talent. We’re looking forward to working with him,” says Jennifer Biela-Moll, Porsche Motorsport Junior Programme. The candidates who participated in the selection programme were put forward by Porsche’s worldwide one-make cups. 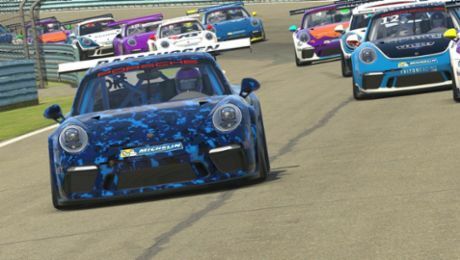 Over two days, the young racing drivers demonstrated their skills in the Porsche 911 GT3 Cup on the Lausitzring racetrack in eastern Germany. One of the decisive evaluation criteria was how well they worked together with the Porsche team. For the 2018 season, Andlauer receives a funding package totalling 225,000 Euro towards his Porsche Mobil 1 Supercup campaign. 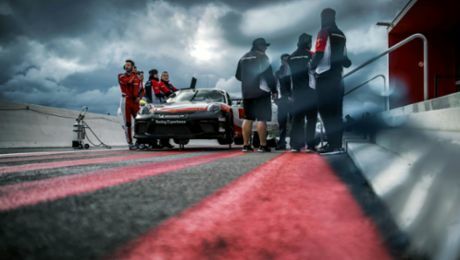 Moreover, the Porsche Motorsport Junior Programme also includes driver coaching, fitness tests with individual training plans, psychological training and media relations as well as the integration of the driver into PR activities. “We’re delighted to welcome the very talented racing driver Julien Andlauer to the Supercup. The Porsche one-make cups are the ideal launching platform into a professional racing career,” says the Head of Porsche’s one-make cups, Michael Dreiser. Earl Bamber is a perfect example of this. In his maiden 2014 season, the New Zealander promptly scored overall victory. He was then contracted as a Porsche works driver and won the 24 Hours of Le Mans twice. “I’m absolutely thrilled to be chosen as the Porsche Junior. My father and I watched the two Porsche Mobil 1 Supercup races at Spa-Francorchamps this year. It was extremely impressive. The Supercup is a big challenge for me,” says Andlauer. The international championship celebrated its first race in 1993 at the San Marino Grand Prix in Imola and has run as a support series to Formula 1 ever since. In the Porsche Mobil 1 Supercup, Andlauer will face seasoned professionals, aspiring rookies and ambitious amateur drivers. Since childhood, Andlauer’s passion has been motor racing. His father manages a kart track in Lyon. At the age of six, the young Frenchman climbed into a kart for the first time. In 2015 he advanced into the French Formula 4, where he achieved third overall. One year later, the driver from Sainte-Foy-lès-Lyon contested the Porsche Carrera Cup France. At the end of the 2016 season, he was crowned runner-up in the rookie classification. This season, the recent high school graduate took home the championship title of the French one-make cup after clinching seven victories. When Andlauer is not sitting in a racing car, he likes to keep fit. “I’m a big fan of boxing. The sport uses the whole body and it improves reflexes. Mixed martial arts boxer Connor McGregor is one of my biggest idols. He lives the sport and is very ambitious.” With these qualities, Julien Andlauer is also keen to impress in the 2018 Porsche Mobil 1 Supercup. The exclusive partnership includes fireproof racing clothing as well as shoes and luggage.